PLANET EARTH FLAG... A STAR MAP? INTRO: The symbols that are about to be explored in this article, even for those not interested in the conspiracy claim here on the flag NASA are keen to use, will shock even the most skeptic of readers. It is a large component of the study of an ancient astronaut human genesis. Read on and see why. A new flag (above) has been created to represent planet Earth ref and designed apparently for the NASA manned mission to Mars in 2025 ref . Here is a news launch ref . The design appears to use ancient universal archaeoastronomy symbols and codes that are all common with the representation of a specific cosmic area in space. The domain of an exoplanet location of our star ancestors near a sun star located close to the Pleiades. If true, it is not Earth founding Mars at all, but repeating a secret human genesis historical record identified at the end of the article! The artist has a website launching his creation ref . He created a very revealing 3D trick that launches 4 of the secret symbols. If you look closely at the flag below it places 3 circles as a Trinity symbol on top of four, but two of them literally burst right out from the center raised ring at you creating the Ichthys symbol and Vesica Piscis symbol. Mouse over the image at the top of the page to see it. This intentional altered feature is in my opinion beckoning you to interpret the symbols created in this portion of detail. 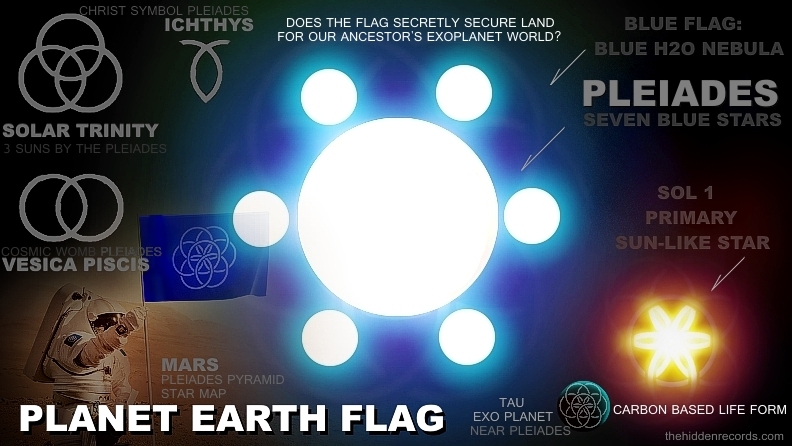 Place your cursor over the image below to see what I believe the new Planet Earth flag design secretly depicts mainly due to the undeniable seven secret symbols that are cleverly positioned in it that are about to be revealed and tested (see next image). Let first identify what you are about to explore here, either a very well researched creative design with a message or something completely spiritually guided! I say this with greatest respect to the designer who might have presented a well researched gnosis secret symbol creation by himself, or following NASA orders some will insist, or as I strongly suggest, divinely inspired. I think it was the latter. Another mind blowing 'coincidental' twist to the story unfolds here which you will discover at the end of the article. Here's the thing, and this is where you will not leave this article in doubt... the flag encodes seven measurable well researched elements, some only recently deciphered sacred symbols where all fall into one common theme. For some time, since 2005 I realised the golden mean human blueprint geometry code ref fits in a cube design and also fits snugly in the Flower of Life circle pattern. I decided it was just too much to include with an already complicated story and put it on hold to wait for something important on the code to launch first. This is that time and the human code has been updated ref . All the elements are part of an ancient teaching of gnosis of a sacred part of space... a primary sun star near the Pleiades. Mouse over the image below to see these two clearest symbols themes in the flag, The 7 circles for Pleiades and the sun star at its centre. NASA and the powers that be recently decided that it is close to the first human mission to Mars and we need a new flag to plant on the Mars planet. An official flag that represents all of Earth as one ref . A Swedish designer has unofficially been promoted as the winning design and this is his design at the top of the page. His name is Oskar Pernefeldt and this is a link to what sounds like an official launch page of the Planet Earth flag ref . A press reference page is here ref . The designer has some explanations here for his flag design and how it should be decoded by humanity ref . I noticed the creators explanation of how all the flag components seemed vaguely artistically acceptable but I had hoped there would be better earthly representations that would fit more convincingly for what I was seeing. Firstly is it a coincidence so many controversial symbols were visible in the composition yet not spoken of in the explanation? 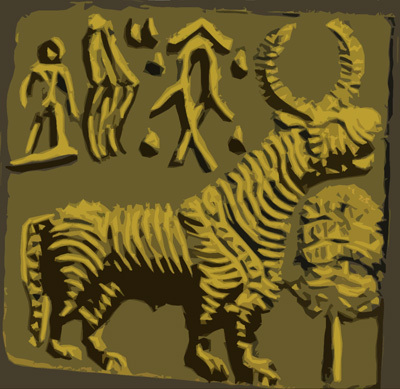 Secondly what were the chances the collection of symbols I saw would all be of one very unique Taurus theme? It is time to look at the elements I have identified in the composition and what they most likely mean due to some ground breaking new breakthroughs I have made over the years in symbology. ref . 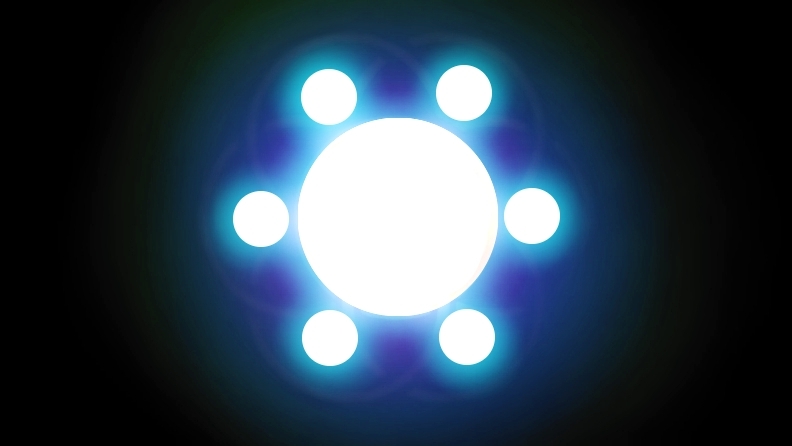 There is one more controversial encoded Pleiades connection but its not on the flag itself so it cannot be included. It is what the flag will be used for. It will be used on Mars which has the Pleiades correlating pyramid star map ref . Each of the seven symbols will be studied and referenced to explain why I claim a Pleiades star map hypothesis decoded in the flag is more than obvious. This symbol in image below is the main 'anomaly' in the flag that stands out as an intended clue as explained earlier that has its two edges placed entwining and lifted above all the other circles and centre circle in the flag. Mouse over the image above to see it as well as the main Mars image at the top of the page. 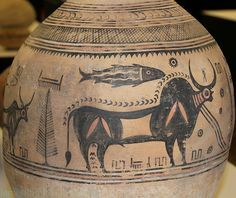 It probably originated in the 5000 yr old Indus civilisation ref where cosmic bulls were often depicting Pleiades as a fish correctly behind the bull's neck on vases ref or on clay seals using the fish in simplified symbol form here ref and here ref . Scholars argue over it here ref . The coin is a complete an accurate Orion and Pleiades and sun star positioned star map on its own! Look closely at the coin in the image above and compare the pattern to the precise star map animation with Sol 1 Primary position here in the animation. The modern revived Ichthys fish symbol ref used by Christian followers these days is one many have seen in bumper stickers on cars. 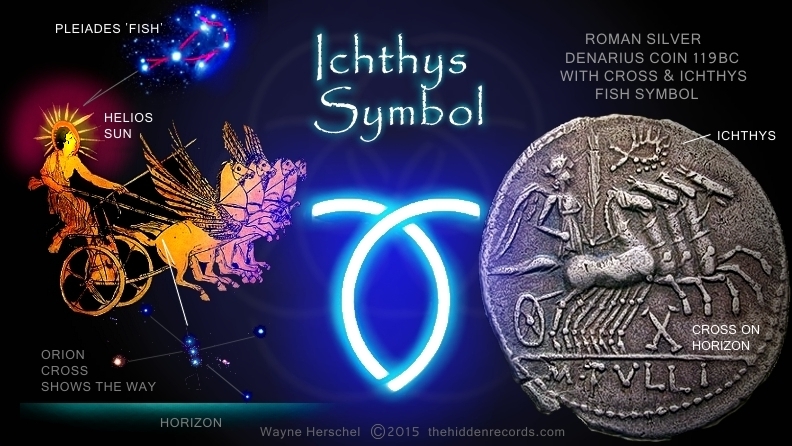 Since 2004 I included this coin depicting Pleiades as a fish symbol (or fish shape wreath with ribbons symbol) with my Vatican layout plan star map discovery ref , but the coin online link went missing and I started to worry about its authenticity. Another coin of the identical detail was placed online and it proves the coin is real and it is of pre-Christain origin ref . The arguement about the symbol if it is a fish or wreath symbol for Pleiades swings towards the fish direction when compared to this Greek vase here ref . There are more coins showing portions of the star secret. Here is one showing Orion cross with a blazing star in the 'heads' side and the horses of Helios beneath the other two suns with an exoplanet and drinking from the Holy Grail! ref . If you think it might not be Orion as the cross, then here is one with the belt stars included ref , and one proving it it is Helios with horses having his blazing crown ref . There are many other versions of these coins as specified of the same period to test my decoded reasoning here ref . 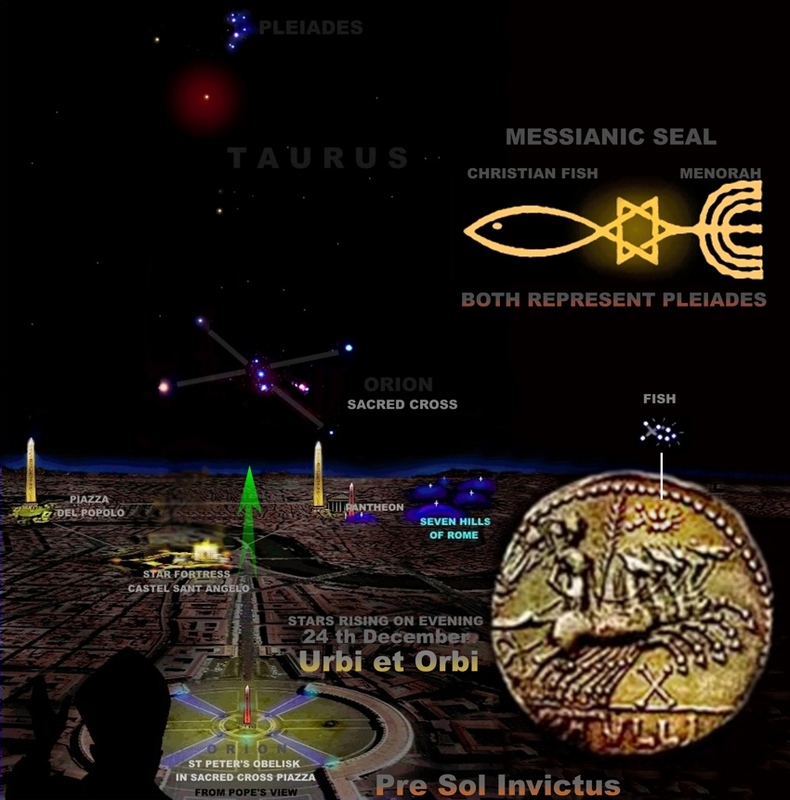 It is no mystery the Pleiades is a part of the Christ story starting with the most obvious. The Biblical epic of Revelation when one from the heavens returns of 'Christ' status in the future holding his cosmic address in his right hand ref . Ancient Roman cross depictions before the Christ era show that they already had in my opinion a pre-Christian law of murdering any person who was caught teaching of the cross of Orion alignment secret to find the place in the sky of a world of our ancestors in crescent light near seven stars. The 'law breakers' were put to death in public as heretics for speaking about the forbidden cross. They were nailed to a cross in this regard to frighten others who delve into these forbidden teachings showing all humanity is sacred from the same place. 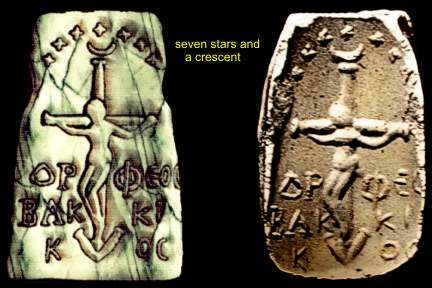 Here is a reference to an artifact showing the crucifixion and places the cross with victim and with seven stars ref . Some other photographs show there are different artifact versions of this ref . But only recently I realised the coin depicted Helios the famous Greek Sun god ref . seen with four horses and that I had a complete accurate star map on a single coin! In the image above, the symbol of two circles intersecting is known as the Vesica Piscis symbol ref . I discovered the cosmic meaning of it as depicted in many ancient accounts was one of the cosmic womb of the Egyptian goddess NUT ref . I am convinced it became integrated into the Christian story too as the womb of the Christ birth and more ref . Then in 2010 I realised the Vesica Piscis cosmic womb also depicted a stargate wormhole which was mainly used in depictions of The Christ 'return' in the book of Revelation with his seven stars stellar address in his right hand in the image above ref . In 2014 I saw it again in research as a cosmic womb wormhole opening for the sumerians too ref . I found the symbol also was very crucial ancient knowledge as the sacred feminine aspect of the Holy Grail when I discovered the real Holy Grail in 2014 ref . But the best usage of the symbol on our planet showing it in a cosmic union teaching with Orion's male anatomy is built as the 'x' that marks the spot in the Washington DC star map ref . In the image above I propose the Trinity symbol here is found in the flag from the three circles created by the circles identified in the mouse over flag source image. 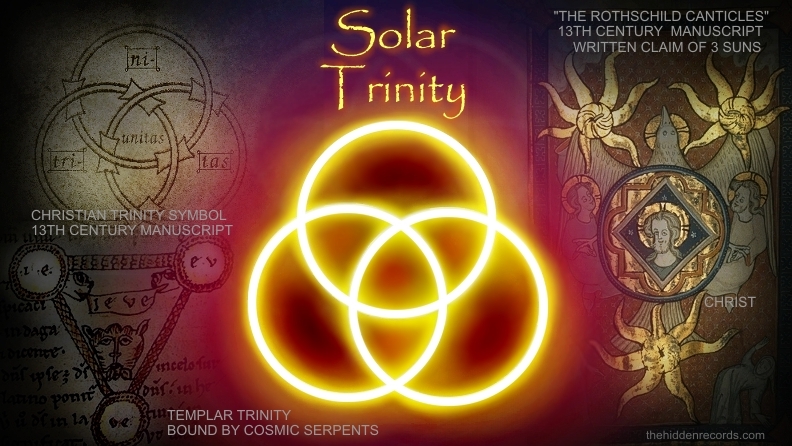 The Solar Trinity three circles symbol I believe originated as a symbol identifying 3 sunlike stars near the Pleiades. What remains of it today is the altered version in religion where it vaguely identifies God, son and holy spirit after the cosmic sacred feminine woman teaching was thrown out of holy books. It clearly has origins in the personification with deities originally as father mother and son for the three sun-like stars ref , that form a triangle position as the sacred feminine womb of stars down pointing triangle when seen on eastern horizon when rising ref . 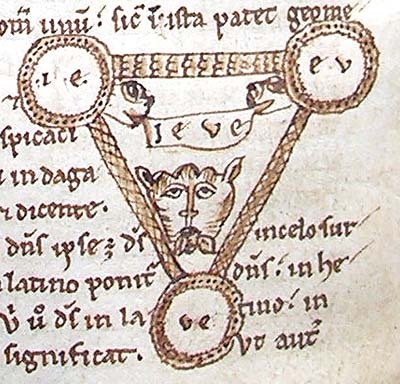 Seen in a thirteenth century manuscript for the Trinity of the churches comprised of three Borromean rings before it was removed ref . It was also the theme of a Templar Solar Trinity bound by cosmic serpents as conduits that 'angles' (star visitors) travelled along or within them between the three sun stars ref . But recently I learned the Rothschild's family had their hands on this illuminated manuscript and this is why it is called The Rothschild Canticles ref . It was documented as such more recently with the famous owners name but the manuscript is an early 1300's sourced work. It clearly writes that it depicts three suns! I noticed these suns have spiral conduits opening in them and 'personified' by father mother and holy spirit. Each sun has seven rays as seen in the Freemason records for the primary sun star which I propose symbolises the Pleiades area of sky. ref . There is a second page from the codex showing more here ref . The Christ at the centre with our Sun and a sacred symbol. The sacred symbol of the "barbed quatrefoil" ref , I will verify at the conclusion of this article that this diamond with four circles symbol originated from the Flower of Life carbon human form code. Thanks to a dedicated researcher Franco Montevecchi of Italy for bringing this symbol into contention here 'coincidently' just at the right time in our research groups on social networks. In the image above... the secrets of the Flower of Life pattern ref . 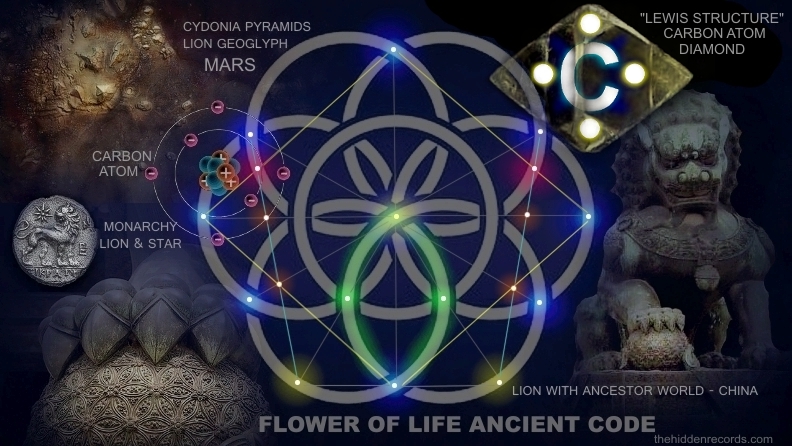 I proposed some years ago since the Flower of Life pattern is shown in many 'genesis' theme historical depictions ref 1 ... ref 2 and from my own NDE near death experience 'learning' ref that the Flower of Life pattern constructed by the mathematical code of Borromean rings ref is for me definition of human life as a carbon based life form ref . But it complicated further my already very complex hypothesis so I chose to leave it out... until now. Why now? Some breakthroughs in this article prove there is more to reveal and secondly the flag choice for Earth by the 'powers that be' has been initiated. I believe I might be the first here offering this precise human carbon life form code hypothesis. 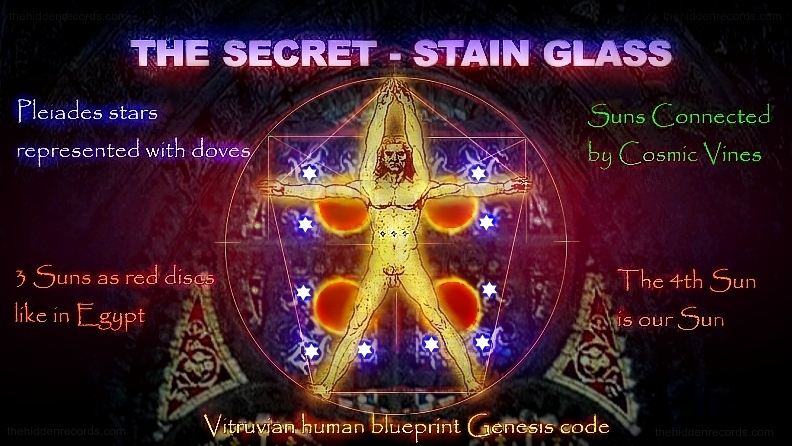 I am well aware author Drunvalo Melchizedek generally coined the term Flower of Life ref and his theory included general atomic patterns geometry but he does not ultimately define the Flower of Life as a human 'carbon life form code' directly with Vitruvian man in the precise and more measurable way that I present it that follows. I stand to be corrected if there is another researchers claim published in public predating June 2015 then I would like to reference them accordingly. The same author generalises other pattern matches with Vitruvian Man but I will show something quite unique here in this article. 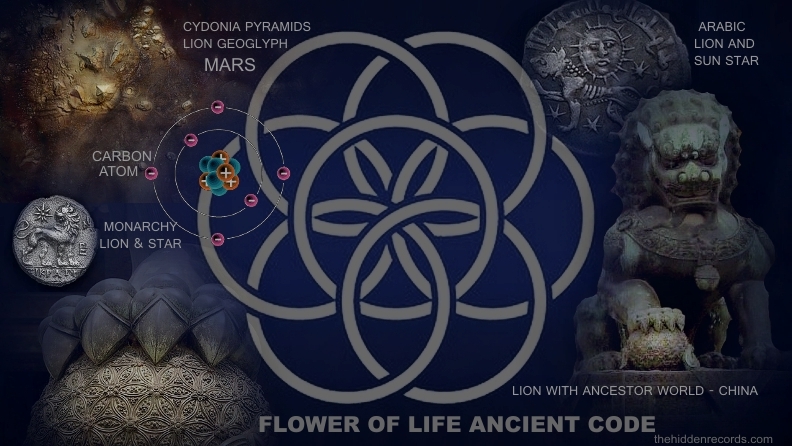 But for me finding the symbol explanation in ancient sites with a lion then finding the largest geoglyph in our solar system of a lion on Mars in the Cydonia area ref , that was when it all came together. The image above shows a zoom in overlay of the orb beneath the ancient cosmic lion's paw ref . 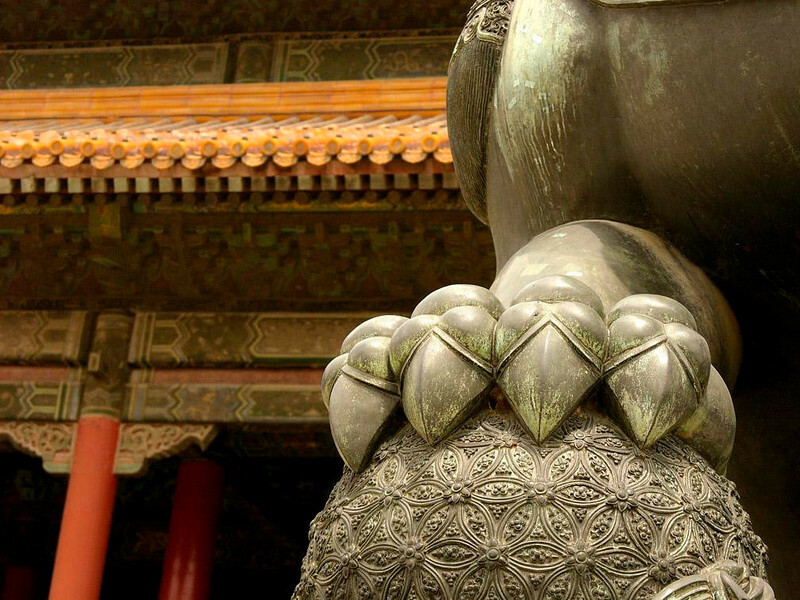 A lion that is another encoded version of a Cosmic Dragon Serpent that the monarchy no doubt discovered was the symbol of the human colonisation event that they adapted for themselves. The globe fits representation a world of life ref . The symbol fits the carbon life form pattern like our world. But its not our world being portrayed in the ancient depictions. It is the exoplanet of our ancestors in the Pleiades area. Quite a bold claim, but here is your proof ref . The carbon atom ref has the sacred form with 6 electrons and its 'seventh' element, its nucleus to bond with all that life needs to propogate. 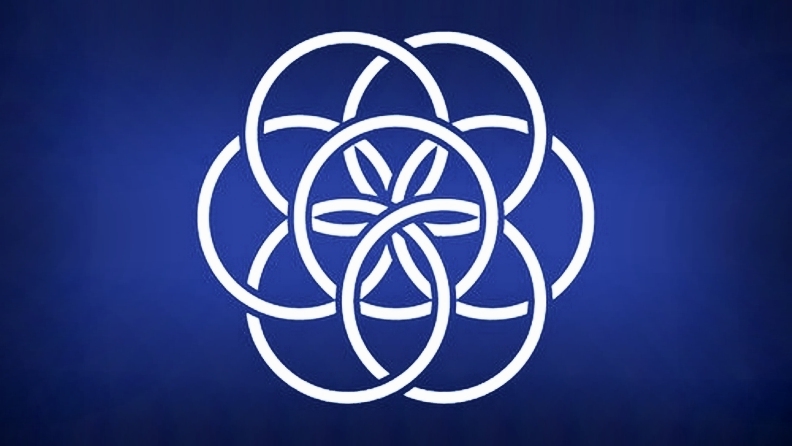 Now in the Earth flag proposed pattern simply compare the nucleus shape with the chosen seven element Flower of Life. Its obvious and was not mentioned. It is a small group of orbs of similar pattern with the sacred 7 combination. 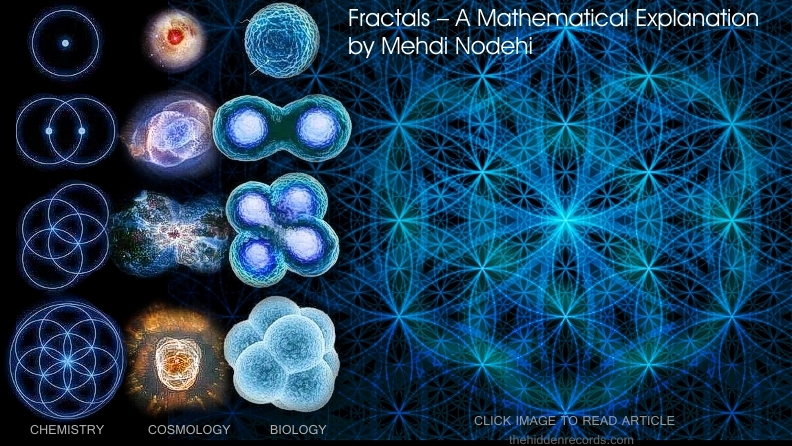 Thank you Maggie Rendon for linking me to the best mathematical article on the Flower of life, click the image below to see the full mathematical model by Mehdi Nodehi. It includes the Platonic Solids aspect too that I was able to experience in a near death experience that occurs within the design of this pattern itself ref . There is more here in this universal pattern for 'life', in the image below chemistry, cosmology and biology... look how cells divide from conception, the first seven cells are also a mirror image of the flag ref . There is just one reason according to the artist here for the choice of colour but I believe there is much more and it is an important component of the design. The designer chose blue as it represents water. 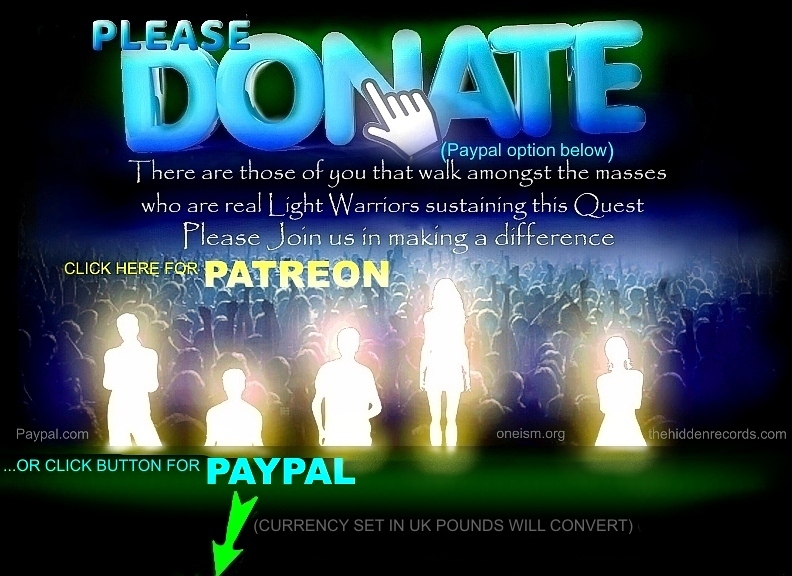 I believe this is without doubt the most important choice of representation in light of what a human colony planet would appear like when viewed from space. If the flag symbol represents human carbon based life then the carbon atom and water molecule are the two biggest components of the human body as a life form. 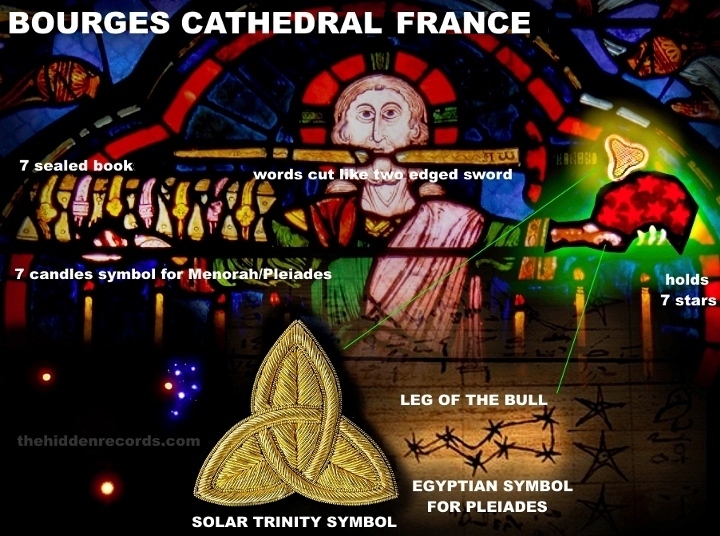 Formed in the centre ring on the flag it represents I believe the primary sun star seen as the most important in most ancient civilisations ref as shown in the image below with a mouse over action. In historical cosmology tradition a six pointed star brings the Hebrew Star of David into contention here due to its secret geometry match in meaning and origin ref . The ancients often made the seven stars into a geometric pattern and for years I did not realise any good reason to do this. I prefered they kept it to an accurate depiction if we are supposed to view the detail as the Pleiades constellation. Now in context with a human carbon based life form teaching representation it makes sense the ancients who were visited by their star visitor ancestor teachers would have taught the meaning of the carbon pattern as a human representaion symbol. We have seven components of the flag now discussed and you have probably noticed each component is number sequenced matching to its sequential symbol pattern. Is this a coincidence a seven numeral theme unlocks a message as you decode all seven parts in order? I am convinced this is all no coincidence and its design is even older than humanity's arrival here on this earth. If it were not for the altered position of the rings in the flag to intentionally place three rings of a specific pattern in front where it sets of three ancient symbols, then I would say its just a universal general carbon life form representation flag. If you missed the main clue then mouse over the image with astronaut at the top of the page again and read the Ichthys paragraph a second time. Its possible now to see how these seven components as seven circles intersecting hold the final piece of the puzzle defining humanity geometrically as one would expect it should. In my star map discoveries I have identified an altered Vitruvian Man pattern. One where the hands were once depicted in the above position as seen in the Heinrich Agrippa codex ref . In the image below I found many years ago the human golden mean geometry found in the Da Vinci Vitruvian man formed within a three dimensional cube which in turn fits in the Flower of Life geometry pattern too. I have avoided mention of it previously as explained due to making a complex subject more complicated. 1) First mark with blue dots the outer most circle intersections and the center point. 2) Now ... seen with the mouse over detail... take the primary flag clue of the Ichthys portion shaded green and add two more green dots at the main intersecting point and scribe lines through all points from the centre. Include the two new yellow dots where the Ichthys part touches the outer circles. 3) Now complete the sacred part of the carbon matrix that makes carbon the reason life is possible ref . 4) Now add the 4 valence electron bond points of the carbon structure called the "Lewis Structure" ref creating its diamond shape matrix (yellow lines added)as carbon pure diamonds naturally form in lattice crystal by joining the top and bottom points of the design with the outer widest points of the flag design. 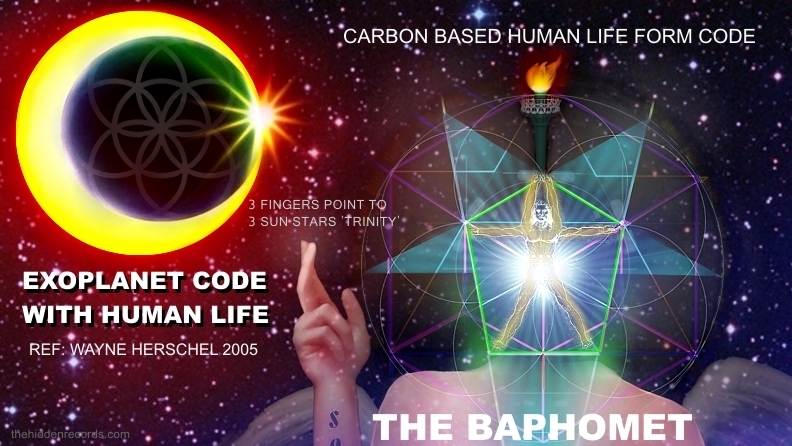 The image above defines the secret of carbon based human life form portrayed virtually with diamond lattice and the 4 outer carbon bonds. We have already seen this symbol with the 3 Suns in the Rothschild's Canticles manuscript earlier ref . Is this a code for the sacred human carbon based life form, the symbol of the "barbed quatrefoil" ref . Special thanks to Franco Montevecchi suggesting the importance of the star map connection with this symbol. The symbol is found in the Maldova star map discovered by Márton Molnár-Göb ref . It is in many Christian depictions like the St Francis of Assis ref . 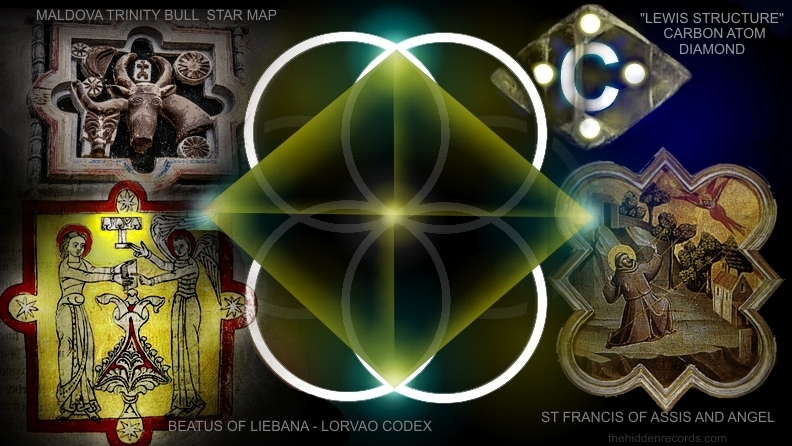 Here is where researcher Márton Molnár-Göb struck gold with more on this symbol he found in an illuminated Beatus of Liebana - Lorvao codex ref the detail of Christ with Pleiades on top of the tradition of the Christmas Tree. This is proof for me where I have claimed all along the Yule Tree represents the star shown with with beam of light in ancient depictions from this Pleiades area ref . The Tree of Life is next to the Christ figure as The Creation source of all life as souls ref . 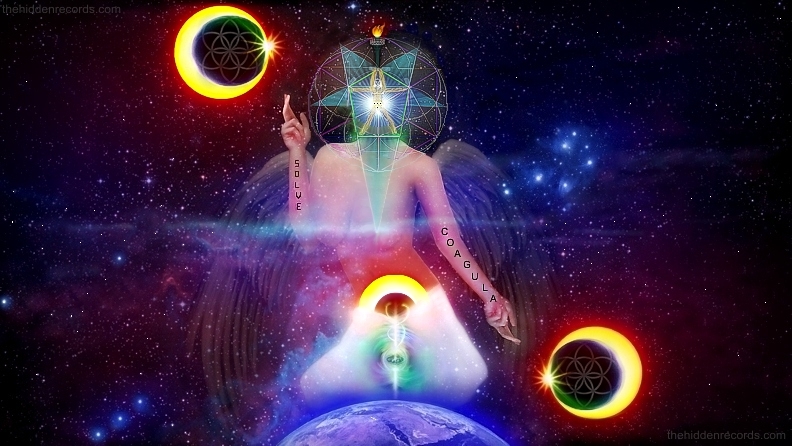 Let's get back to decoding the geometry in the image above as shown completing the Flower of Life symbol. We have covered in bold the first 4 portions of the geometry, now we just need two more obvious points of geometry common alignments shown with light blue lines. 5) Complete the Equilateral bottom portion of the seven circles and add lines from the base of the equilateral up to the two top circles outer edges with light blue lines. Note in doing this how it crosses other geometrical common points which are added in. The math here seems magical. 6) We have a unique 5 sided pentagon with Equilateral base and special golden mean portions of perfection under discussion here ref ... add the Vitruvian Man template... it fits. It is a mirror pattern duplication of the Rosslyn Chapel Human code stained glass window ref as explored here ref . 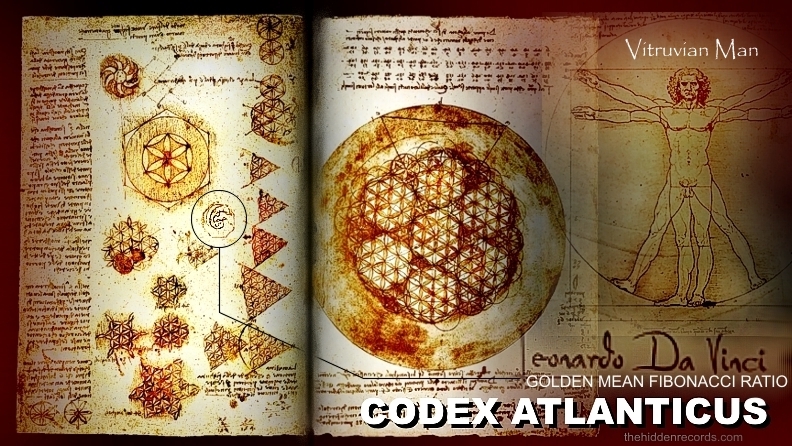 Leonardo Da Vinci shows in his famous codex called the Codex Atlanticus ref . that he was working with all of this geometry and Pleiades cluster template symbol as reasoned earlier here in this article. He showed on the pages below the seven circles carbon Flower of Life but not intersecting in exactly the same way as I have offered ref . He showed how he chose the equilateral portion of the circles needed for Vitruvian Man's legs ref . and experimented with many different sketches but did not show how the human form fits due to the first error as mentioned. If you look closely between the equilateral sections he also shows the Fibonacci golden mean pattern too which is a major part of the human code. I can't believe this genius made this error because in his Vitruvian man version he blatently showed he could not complete his human blueprint code with hands in upright position. I believe this is due to finding out what happend to the German scholar Heinrich Agrippa ref who completed a version correctly and was jailed and his books destroyed, and some say secretly murdered at an early age as all records of his death are missing ref . In view of a possibility The Flower of life has a blatent flaw I am sure this was a choice he made showing just clues encoded for a later scholar to complete it. The Templar and Freemason legend of the Baphomet ref was supposed to be a sacred feminine deity sitting on the Earth pointing to two crescent realms while birthing a third and most important realm. I depore what the ancient elite did to this sacred teaching of the sacred feminine area, It is obvious her sacred human form geometry identity was given for her face as she was created as a teaching mechanism icon. The ancient elite apparently by reasoning clues here found a cruel way to demonise all the sacred records of sacred teaching manuscripts. The Bull crowned Sumerian deities, the Egyptian bull crowned gods were all demonised as forbidden. What excuse could the elite fabricate to kill those with these records as heretics? They created the lie they were devil worshipers... the devil is one with horns and anything associating with these records are the devil. The geometry of the human form fits the Flower of Life pattern. The sacred feminine just like the Christ points with three fingers which I propose signifies the direction to the Solar Trinity realms. Stonehenge has the human bluepring carbon based life code... Egypt has the code... Rosslyn Chapel has the code and other too... ref . 1) Ichthys ................denotes Pleiades star area. 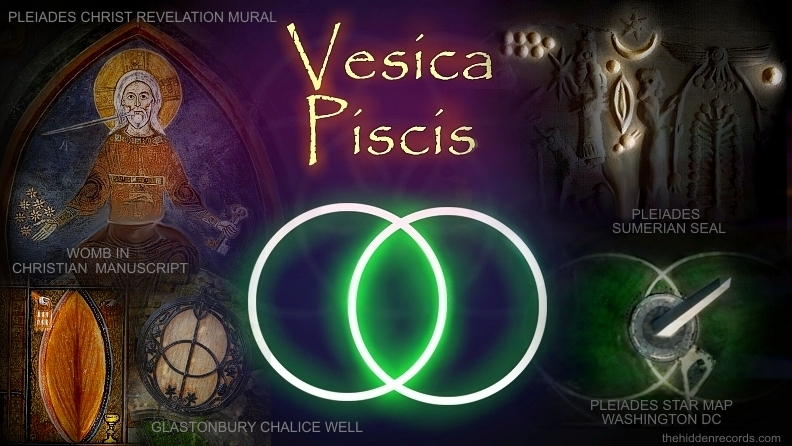 2) Vesica Piscis........denotes cosmic womb portal. 3) Solar Trinity..........denotes 3 suns near Pleiades. All these symbols decode as a star map and a portal to this place of our origins. Now if this is placed on a flag to establish landing on Mars it is placing this ancient message in founding Mars. WE ARE PLACING THIS FLAG ON MARS AS HUMANS FOUNDING CIVILISATION FOR A SECOND TIME REPEATING AND MATCHING THE ANCIENT MARS PYRAMID STAR MAP MESSAGE! The founding of humans again on Mars as beings from Pleiades was encoded in the irrefutable mind blowing correlation star map of the Cydonia Mars pyramids that has the same Vitruvian Man human message with a human face monument... here is the full story... ref . 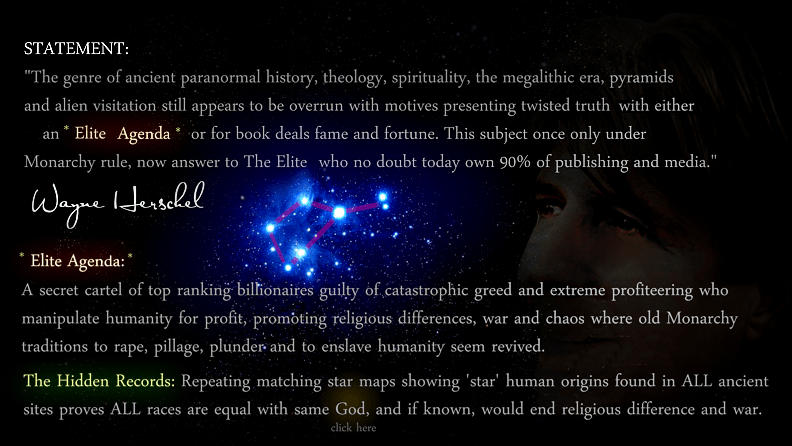 If you think NASA are not aware of the ancient star map knowledge then think again... ref .